Every time we take a stroll down Peddar Road, we're taken by surprise. With new stores springing up often, there's just so much to do and see. Not just that, there are old staples, hidden from view. We're tapped into one such wonder. Read to know more. It's been 45 years since Paraphernalia's inception. And the woman behind it is Pallavi Jaikishan, a renowned designer who has been draping the Bollywood divas in style since 1970. 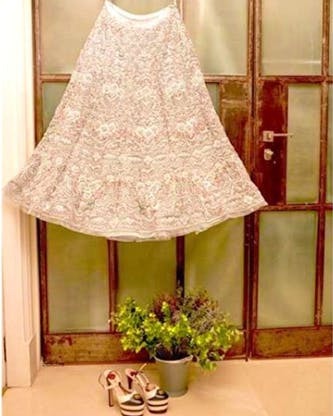 Her vintage sarees in wispy whites, and beautifully embroidered floral lehengas reflect her own sense of style. Her stint with fashion and clothing began when she was a kid, and during her times, she used to get all her clothes stitched by tailors, due to lack of good ready-made options. That's when she got to design her own clothes, and since then, she has been wanting to grow up and design for others too. Paraphernalia is all about the richness of traditional Indian clothing, be it a saree or a lehenga. They also have pretty cotton kurtas for INR 11,000 (a tad on the higher end, but it's designer wear). And if you're looking at splurging on yourself, or if you're someone who's getting married, or you have a very special event of your life, just pick up one of their pastel lehengas, and you're sorted. Save up for that special occasion and head out here!